Former outsiders rebelling! Akopian is already in the middle of the pack and tries to move forward. Eljanov won the second game in a row as Black – against Kamsky, who clearly lost the punch. 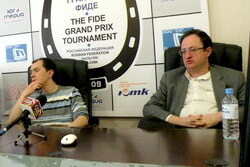 Gelfand finally put up a solid performance, beating Kasimdzhanov brilliantly. 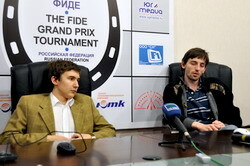 Talking about the leaders, Grischuk saved half a point in a heroic effort against Karjakin. Aronian still leads the race. Another unsuccessful game by Kamsky. He is either too tired or just did not recover after the previous round loss. In a quiet and maneuvering game Gata applied serious pressure on the opponent’s position, but chose the wrong time to start the attack. He certainly saw the simple 31.Rab1, which kept the advantage, however, instead of it the American forced the issues by 31.Bxc5? !, missing the unexpected 35…Nd4! The idea with a fork on e2 apparently surprised him, and the situation quickly changed in Black’s favor. Clearly disappointed, Kamsky was unable to defend tenaciously. Eljanov proved that he is an experienced hunter – patient and lethal when the time is right. This epic struggle demonstrated that Gelfand is back! In the Anti-Moscow Gambit of the Slav the Israeli created an excellent new setup starting with 9…Nbd7!? Black sacrificed the с6-pawn, but got a couple of tempi for development, which allowed him to get an equal game and take part in a fight for the center. 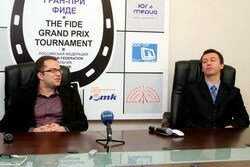 The game was decided in the opening (the Chebanenko Slav). By 11…exd4! Svidler improved his play against Alekseev. Despite arriving to Nalchik without a second, Peter finds the time to move the opening theory forward, scoring a few points in the meantime. Aronian was unable to come up with anything serious (his 13.g3 is anything but ambitious), and Black got an excellent game. His knights were excellently placed in the center, not being inferior to the White bishops. After logical maneuvers and exchanges the players agreed to a draw in an equal endgame with opposite-colored bishops. In the Queen’s Indian Defense Black defended according to the standard scheme, and then launched a successful counterattack. The plan with e6-e5 and Nb8-c6-d4 is known for many years. It is surprising how easily Bacrot carried it out! Computer shows his novelty 15…e5! in a second. Not sure what Leko missed in his preparation. In the final position the struggle around the d5-square (White wanted to place his rook there, while his opponent objected) led to a draw by move repetition. 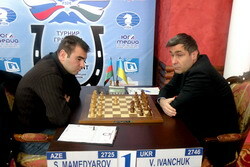 Ivanchuk flashed a new opening idea (11…Na5!?) in a well-known sharp line of the Gruenfeld. He gave up a central pawn, but this was a Danae gift. White accepted the sacrifice, and then had to use all his creativity to survive. The crowd admired a number of tactical tricks by both players. For instance, everyone was surprised by 15.Bf3! with the idea e2-e4. White got rid of a nasty pin, but he didn’t have any advantage. The further simplifications could not alter the evaluation of the position as being equal. The grandmasters ceased fire in a deadly drawn ending. In a fashionable line of the Queen’s Gambit White grabbed a pawn and managed to place his pieces actively. Black regained the material only by weakening his kingside (15…g5!?). 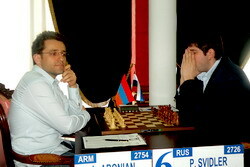 Akopian, realizing that he must play very energetically, carried out a spectacular blow 19.c4. Without trying to criticize his choice, I will suggest an intermediate move: 19.Rad1!, intending to meet 19…h5 by 20.f3 Rxe3 21.Nb5! with strong initiative. The text-move allowed Black to centralize all his pieces. Alekseev managed to bring his knight to d3 and fortify it there. White initiated exchanges by 32.Bxc5, but they only led to an equal ending, in which Black forced the perpetual. Both players are very fond of the Najdorf Sicilian, and in this game they continued to explore their favorite lines. In my opinion, Black successfully solved the opening problems. 15…g4! revealed that White’s attack got stuck. Karjakin made a correct choice to enter a complicated ending. Black had a few pawn weaknesses on the kingside, and White’s bishop pair was a force to reckon with. Grischuk rejected the active 21…d4, which was probably wrong. Active piece counterplay would give him an equal game, while after the exchange of the bishops he had to defend passively. Black’s situation became worse when the opponent’s king arrived at f4. Instead of 42.b4 White had a much stronger 42.a4!, stretching Black’s defense. Karjakin missed this chance, but continued to apply pressure. Grischuk was short on time, as usual, but on this occasion he managed to hold, utilizing the opponent’s inaccuracy: Sergey missed the refined 62.Ra6!, which could give him a big edge, and after the meek 62.Ke4 Black improved the situation and survived.